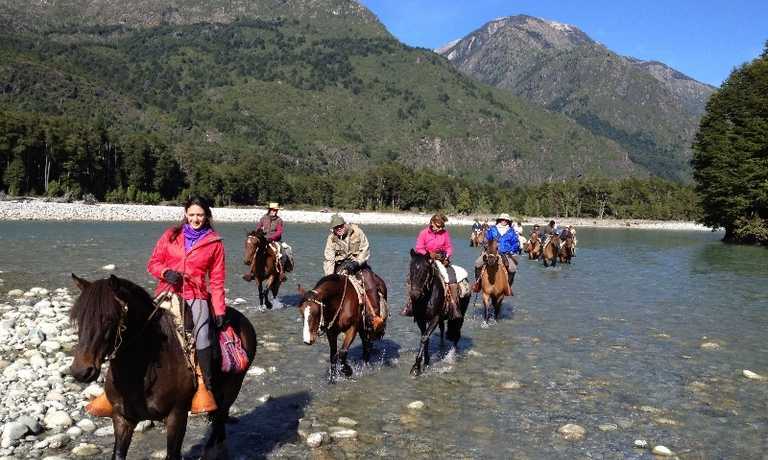 Ride across the open pampas, to the beautiful crystal-clear lakes of Las Rocas and Azul all the while on horse back. You'll spend between 4 and 7 hours a day in the saddle, some nights in local farms where you can relax with a nice glass of wine and others camping under the stars. On your arrival to the Bariloche International airport, a private transfer will take you to your downtown hotel. The city of Bariloche, surrounded by lakes and mountains, is located in the very heart of the Patagonian Andes mountains chain. Depending on your arrival time, you will have time to visit the city and make some shopping before the ride. Late afternoon, a meeting with your guide will allow you to get knowing the team and the following days activities, as well as receive some security instructions. Meals: Dinner at a traditional restaurant, specialising in different kinds of meat. Departure towards the 'Nirihuau' area, located 30 kms from Bariloche, where we find several family ranches. Their owners are mainly dedicated to the breeding of bovines, sheep and horses, as well as to forestation. Distribution of horses and overhaul of equipment. Departure to 'Las Buitreras' hill, a point from where a panoramic sight of the overall area can be appreciated, as well as "La Mina" stream, located close to an old oil field. After a box lunch we carry on our horses, we continue towards the 'Nirihuau' river. After breakfast and having passed some hours riding through gentle hills and large valleys, we start ascending on a path that is mainly used by local countrymen to move their cattle, just to arrive to 'Paso sin Nombre', 1.700 meters above sea level. Leaving this area surrounded by rocks, the view opens towards the immensity and a large valley in the middle of the mountains chain, the region called 'Alto Chubut', appears. The journey continues one more hour, to reach an idyllic place surrounded by native lenga forests. We will leave behind the forests and clear water streams to continue descending to the Patagonian Steppe, an area of dry vegetation where Coiron, Neneo, Calafate and some small Nires (local flora) still lives. Our route leads us to the shore of the 'Chubut' river and some old animal care establishments. We will pass by an old abandoned gold and lead mine. This night we will camp on the shore of the 'Chubut' river. During this day we will cross different small farms in the 'Alto Chubut' region where people lives the whole year. These inhabitants are mostly descendants of the original people: the Mapuche, forgotten in the remote Patagonian lands. We will notice a slow change in the view while we get near to the Patagonian steppe. At first, our ride takes us down the large 'Chubut' river valley, reaching the confluence of 'Rio Las Horquetas', to enter a valley of the same name. We reach 'Rio Ternero' (calf river) region, after a pronounced hill ascent. The valley is large and full of different kinds of vegetation. In this area, we find a high Nire forest as well as low stocky Nire woods called 'achaparrados' and large areas of pasture land for the cattle. Camping under the protection of natural forest. Our last day with horses at the Argentinean side. We will follow an old road that will lead us to 'Cuesta del Ternero' area. There we will appreciate a typical view of the Patagonian transition, where the magic of immensity will remain in our memories forever. We will leave the horses and share a last picnic with the Argentine baqueanos. A short half an hour trip in a transfer towards the magic small town of 'El Bolson'. This town, surrounded by cypresses (Austrocedrus Chilensis) and 'maitenes' (Maytenus Boaria) woods, enjoys a microclimate that favour the production of red fruits such as raspberries and cherries, as well as of hop for craft beer elaboration. Accommodation at an hotel and dinner in a local restaurant. Time: 30 minutes in a private minibus from El Bolson to Lake Puelo; 2:30 hrs Navigation in the lake. This morning, a transfer will take us toward the Puelo lake, to continue our adventure in a turbo jet canoe. We will navigate along two lakes, thereafter crossing the rapids between Argentina and Chile. After the customs procedure, a local guide will help us with the luggage and, after a short walk, we will take another canoe that will drive us to 'Las Bandurrias' island within 'Las Rocas' lake. You will state that the landscape of the crystal waters, with its tempered forest and the surrounding cordillera, are contrasting when compared to the steppe. A friendly and warm welcome will be waiting you at 'Las Bandurrias'. Departure towards the 'Lago Azul', with its astonishing color and abundant fishing possibilities. About three hours on horseback will be necessary to reach the lake. There we will have our lunch on its edge. After the picnic, we will follow our pathway on horseback towards 'Las Rocas' lake. We will pass through an ancient Valdivian type forest, with its completely different vegetation which is found in very few Chilean areas. The scenery of the day : wet ground and very ancient trees, as well as majestic mountains surrounding us. A short travel on a boat up to Las Bandurrias island. This short day on horseback will allow us to rest and enjoy the environment. After breakfast, we will embark to be rejoining our horses where we had left them the day before. We will ride one hour up to the source of the Puelo river. The river is deep and wide. A local will help us to cross on his boat. This will offer the horses an opportunity to swim. The pathway goes on through the woods along the Puelo river to the west, to reach Ventisqueros valley. We will pass the river that cross the valley on our horses just to arrive to our lodging place. In the evening, a peaceful environment will allow us to enjoy a good wine together. 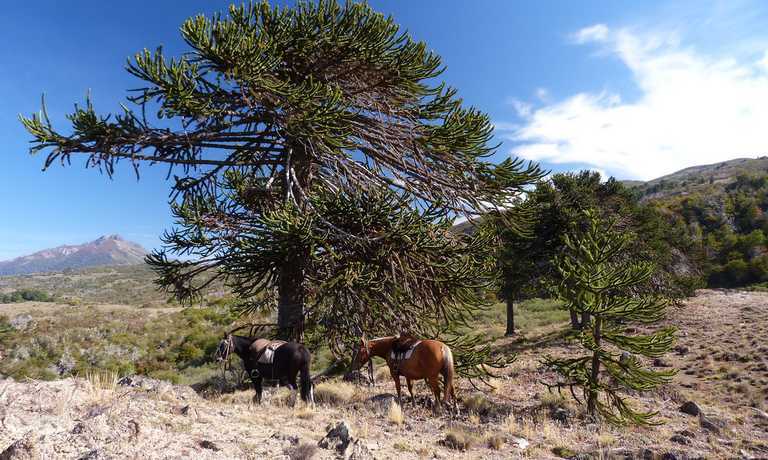 We will start the journey on horseback, mostly committed to the Ventisqueros valley. We will cross several times the river on horseback, in the middle of a wonderful landscape. It is a sparsely populated place, where some residents subsist on livestock breeding. We will take advantage of the river shore to have breakfast and thereafter continue our route up to the end of the valley, where we will spend two nights at a local resident's place. Today, we will visit a neighbour valley, where we will enjoy the view of a hanging ice glacier. The route is surrounded by vegetation and leads to a larch forest. It is a poorly populated region, in the middle of pristine nature. We will have lunch nearby 'El Toro' river, before descending mid afternoon to reach our host. This will leave us time to take advantage of the remaining afternoon to hike, take a shower, rest or interchange with the residents. Another unforgettable dinner. Departure towards the Puelo river. Ancient woods, open spaces, crossing rivers, a glorious journey in the middle of mountains, waterfalls and solitary landscapes. We will enjoy for sure a great breakfast at the Ventisqueros edge. In the afternoon, we will continue the journey passing by different country establishments where the peasants keep using the same procedures to daily cultivate the land, just as their ancestors did. At a certain point of the path, the vegetation becomes more dense. 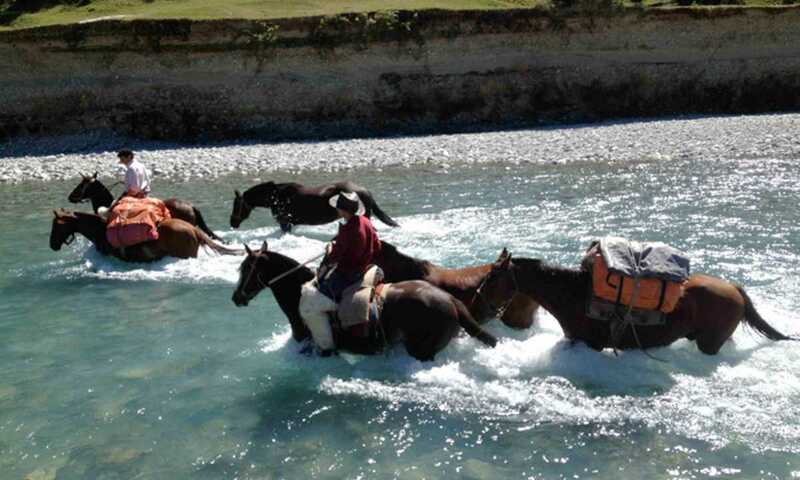 Feel the pleasure to cross the Puelo river just as the locals do: In a rustic boat while the horses swim! 4 hours from Llanada Grande to Puerto Varas and a Ferry crossing of about 45 minutes at the Tagua Tagua lake. For our last riding day, we depart towards the village of Llanada Grande. At midday approx. we will arrive at the place where a transport will be awaiting us. It is right there where we will deliver our horses into the skilled hands of the baqueanos and start a one hour trip in a car, to arrive at the Tagua-Tagua lake. We will cross same on a ferry boat, thereafter continuing along the estuary. We will be able to admire the Llanquihue lake, as well as the Calbuco and Osorno volcanos, same being part of the National Vicente Perez Park Rosales (a 4 hours journey). Arrival to Puerto Varas at about 8:30 PM. Farewell dinner and night at hotel. Breakfast at hotel. A private transfer will take you to the airport. This trip can run as a group trip, with prices starting from $7,980 per person for a complete group. If you are looking to join a group or you are a solo traveller we will help to form likeminded groups of travellers. Please let us know your travel plans.